My teen son, Kyle, loves custom clothing. For one, none of his friends will have the same outfit, and he stands out from the crowd. Also, he loves helping design his own clothes. He really likes fashion, and has his own, unique and often eccentric taste. Recently, we received a custom tee from Customizo. Customizo is an innovative group of sites that help groups with apparel and product design, collaboration and purchasing. With their design tools, group collaboration platform, mobile content integration and centralized hub of fully customizable artwork templates, creating and designing, bringing your designs to life is easy. The tee we received has a bright blue tiger face on it, and it includes very intricate detail. The design is quite vibrant and you could tell that the folks at Customizo take great pride in their work. The shirt itself if very high quality, and even after a few washes looks brand new. There has been no shrinkage, and the colors of the tiger's face have not faded a bit. Kyle really loves his shirt and has worn it all over the place. His friends at school think it's the coolest thing ever, and are totally jealous because they can't just rush out to the store and purchase one of their own. Of course Kyle told them all about Customizo, and I have a feeling we will start seeing more of these tiger tees around town shortly. 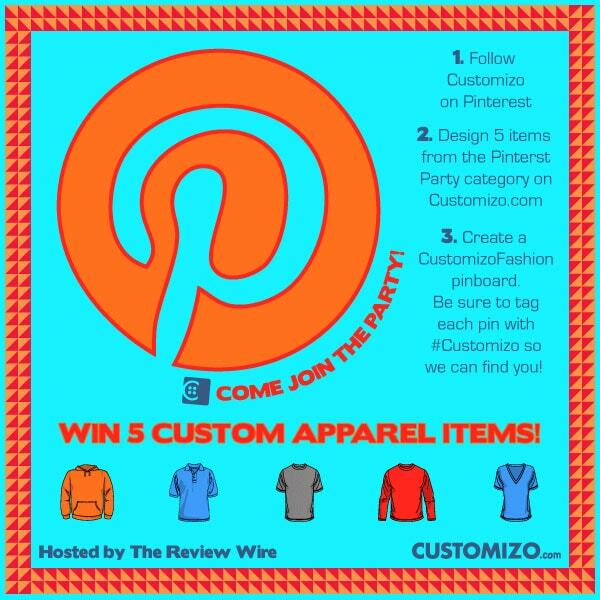 Welcome to the Customizo Pin It to WIN It Event! Disclosure: This event is sponsored by Customizo and hosted by The Review Wire. Newly Crunchy Mama Of 3 is not responsible for prize fulfillment. Companies and bloggers, if you would like to participate in group giveaway events like this one, sign up to be emailed about future events hosted by The Review Wire.